Corruption in our country and throughout the world is rampant. No institution has been unscathed—government, the church, education, the media, the courts. The higher the office, the more power involved (perceived or real) and the more money involved, the deeper and wider the corruption. The consequences are usually expensive for the masses of people on a number of levels. It can also be deadly. This month is the 10th anniversary of the U.S. invasion into Iraq. Hubris: Selling Iraq War is a documentary that serves as painful reminder of how our government took us into the illegal war. The treacherous lie led to the deaths of 4,486 American troops, the wounding of 32,226 service members, over 100,000 dead Iraqi civilians—at a cost of $3 trillion. If you were angered by some of the items purchased by Jesse Jackson Jr. and his wife Sandi with stolen campaign funds (like a $43K Rolex watch, a hat of Michael Jackson, etc. ), we should be on fire about the pack of lies that led us into a war. 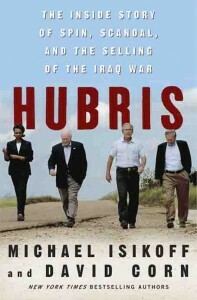 The documentary is based upon the book with the longer title of Hubris: The Inside Story of Spin, Scandal, and the Selling of the Iraq War by David Corn and Michael Isikoff. It aired recently on MSNBC, narrated by Rachel Maddow who challenged viewers to know the truth so that it won’t ever happen again. The documentary was MSNBC’s most watched documentary in a decade. It will air again on Friday, March 15, 9:00 PM ET and is well worth the hour of viewing. It’s not that I was surprised about the revelations of the documentary. I was part of the 80% of African-Americans that the JointCenter for Political and Economic Studies found were opposed to the invasion. Black folks knew Bush and his cronies were up to no good from the git-go. Eventually the rest of the country caught up to us as the lies started to unravel. I can’t help but wonder how the thousands of families of the dead and wounded feel knowing their sons and daughters were sent to die. It was the ultimate betrayal by their beloved country. Hubris had some new information as some of the documents have now been declassified. Like the November 2001 memo notes where Secretary of Defense Donald Rumsfeld met with General Tommy Franks to review plans for the “decapitation” of the Iraqi government. This was the beginning of a full-fledged strategy of deception that went beyond the Bush administration to the highest levels of the FBI, CIA, the U.S. military and all that’s in between. Day after day, interview after interview, these war mongers looked us in the eye and fed the world a deceptive stew of uranium bought by Saddam Hussein from Niger, weapons of mass destruction (WMDs), connections between Saddam and Osama bin Laden, mythical meetings of terrorists and a heap of other falsehoods. By 2005, it was clear that there were no WMDS yet Bush continued to push forward with the war. President Obama finally declared end of the Iraq War at the end of 2011. To this day, Bush, Cheney, Rumsfeld and Condy Rice admit no guilt or remorse about their decision to invade Iraq under false pretenses. So the question remains, why are these war criminals not being tried for treason or hauled before the World Criminal Court? When we the People are unaware, silent, fearful to speak up and stand up when we see injustice, it is us that will be impacted the most and our democracy weakened. Wrong is wrong, yet we allow selective prosecution of our white-collar criminals. If former Illinois Governor Rod Blagojevich can go to jail for trying to sell a senate seat, surely the Bush criminals should face charges for an illegal war that resulted in the deaths and casualties of thousands and nearly bankrupted our government. Today we are going to celebrate some very awesome Krishna Janmashtami which is going come very nearer at 14th of August 2017 in the year 2017. Today we are going to share some of the very new and important segment of happy janmashtami sms and messages in Hindi and English so that we can importantly work on wishes to your friends and family. You can use some happy janmashtami 2017 sms and messages in Hindi and English.